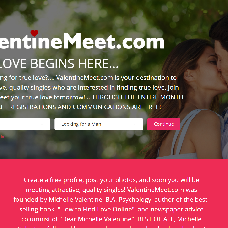 ValentineMeet.com was founded by Michelle Valentine, B.A. Psychology, author of the best-selling book, "How to Find Love Online", and newspaper advice columnist of "Dear Michelle Valentine". Best of all, Michelle Valentine followed her own advice and met her husband online! She is very happily married to the man of her dreams, and she wants to share her expertise with singles around the world to help them find true love, too! Join FREE today, and meet your true love tomorrow! Thousands of quality singles from around the world are waiting to meet you! If you need any help, Michelle Valentine is here to help you! We look forward to your being our next success love story!